Mummy berry disease of blueberry. Blueberries may be nutritional powerhouses, but some types are no match for the fungus Monilinia vaccinii-corymbosi, which causes "mummy berry" disease. Fortunately, U.S. Department of Agriculture (USDA) scientists have more than 100 years of experience in blueberry breeding and cultivation. Geneticist Mark Ehlenfeldt and plant pathologist James Polashock embody the latest generation. They work for USDA's Agricultural Research Service (ARS). With ARS colleagues, they have conducted comprehensive studies examining the responses of today's blueberry cultivars to infection by the fungus, which wages its attack in two stages. 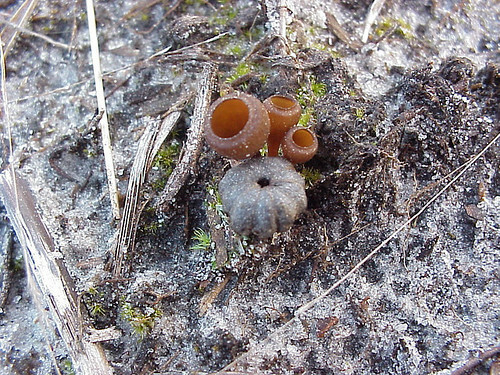 During the first, the blighting stage, small, cup-shaped structures bearing the fungus' spores sprout from berries concealed among leaf litter in the ground. Wind spreads the spores to nearby plants, infecting newly emerging shoots and leaves. During the second phase, the fungus penetrates the berry, causing it to shrink, shrivel and turn whitish-hence the "mummy" reference. Eventually, the mummified fruit drops to the ground and overwinters, setting the stage for a new round of infection the following spring. In a HortScience study, the researchers analyzed blighting-resistance data collected from 125 cultivars over two to six years, and fruit-infection-resistance data from 110 cultivars over two to five years. They then ranked the cultivars' mummy-berry resistance using statistical methods devised by statistician Matthew Kramer with the ARS Biometrical Consulting Services in Beltsville, Md. Ehlenfeldt and Polashock are with the ARS Genetic Improvement of Fruits and Vegetables Research Laboratory in Beltsville, but are stationed at the Philip E. Marucci Center for Blueberry and Cranberry Research and Extension in Chatsworth, N.J.
"Brunswick" and "Bluejay" were among several blueberry cultivars that withstood both fungal infection stages. Read more about this and other blueberry research in the May/June 2011 issue of Agricultural Research magazine. Suskiw, Jan. Mitigating Mummy Berry Disease of Blueberry. Retrieved 17 May 2011.